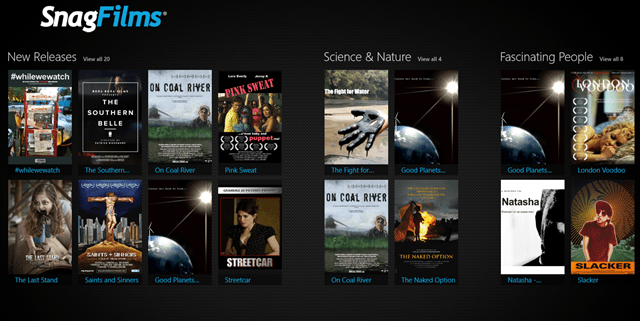 SnagFilms is a free Windows 8 movies App that lets you watch movies online and other videos on demand. SnagFilms provides you the facility of video on demand so that you can watch your favorite movies right on your Windows 8 desktop screen. It’s just going to take permission of your Internet connection and you are ready to experience a number of independent movies of your choice. 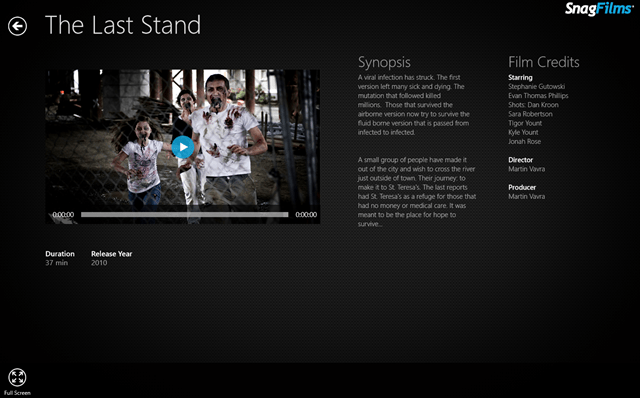 The app for Windows 8 consists of a number of amazing and classic online movies categorized into different genres i.e. Drama, Science Fiction, Personalities, Social, & Politics and also some sort of short movies. Moreover, the movie quality is quite impressive, even i just jump off my seat while watching that feature film “The Last Stand”, trust me…. it was really terrifying. I myself, a humongous movie enthusiast, and I really appreciate this Windows 8 movies app for its collection and new movie releases. As you open the app, it will connect you to the featured films on video on demand and will provide you with the movie’s wiki information or you can say the synopsis, majorly its cast and crew. So, you can flatter your friends with your movie trivia. Well, jokes apart. It’s really a kind of Windows 8 app, you will like in your pass time for watching brilliant on demand movies with latest releases and short documentaries. You can now watch online movies which will inspire you, encourage you and will be a source of great entertainment. Also, check out our post on BIGFLIX App for Windows 8.